Lock in a great price for Hunguest Hotel Sun Resort - rated 8 by recent guests. Beautiful location. Hotel a little outdated but probably best in the area by a long way. Staff friendly. View fantastic. Cute town. Clean beach Great housekeeping. Location. This would have to be the best location in Herceg Novi. Ampul Reastaurants on the beachfront all within walking distance. Reception staff are excellent and parking onsite is a big bonus. Beachfront is concrete so make sure you have footwear. Kristina, the lovely maid who went well beyond her responsibility to asssist us. The beach was lovely and water was beautiful along with very nice and helpful lifesavers team. Our room was big. There is a private beach and pool. The hotel is not far from the centre of Herceg-Novi. Wi Fi did not work properly, the smell in the toilet was awful. Because of profit maximizing, the built so many rooms and tried to claim 4 stars. By no means does this hotel deserve 4 stars. First of all, that is uniqe and extremely friendly personal, especially Lidija at the Reseption. She made all for our comfort stay at this Hotel. The second, this is beautiful territory with swimming pool and private beach. The third, this is convinient location and big parking. Really nice and beautiful hotel! Evrything was exellent! Nice beautiful hotel in the heart of Herceg Novi. Private beach, pool, jacuzzi. Restaurant with bwautiful view. Extremly friendly staff. 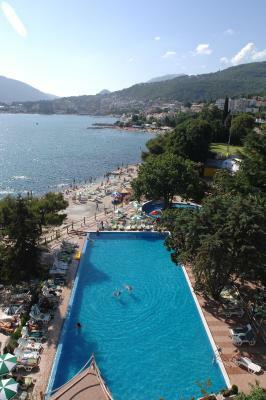 Hunguest Resort in Herceg Novi was wonderfully situated next to the Adriatic Sea. Facilities were roomy clean, and comfortable. Breakfast included a wonderful array of food. Walking along the sea on the walkway was a pleasure! Prices for lunch or dinner at buffet were very very high compared too quality . One of our top picks in Herceg-Novi.Hunguest Hotel Sun Resort is situated in a small park on Herceg Novi's seaside promenade. It has its own concrete beach and a tempered garden pool from May to October. Free WiFi is available in public areas and in the 2 restaurants, Lovcen and Jadranka. The air-conditioned rooms provide free internet access. The hotel provides free sun loungers and parasols and various water sports can be enjoyed at the beach. There is a multifunctional tennis court as well as the wellness centre with infra red and Finnish sauna, a hot tub, a solarium and additional massage services. The Restaurant Jadranka offers a terrace with a view of the sea and serves Mediterranean and international food and drinks. Herceg Novi offers various night clubs that can be enjoyed on the seaside promenade, as well as many cosy cafés and bars. Hunguest Hotel Sun Resort has been welcoming Booking.com guests since 23 Mar 2010. When would you like to stay at Hunguest Hotel Sun Resort? If you want to book a room with sea view, there is an extra 25 % charge of the room rate. Spacious, air-conditioned room that features a balcony with sea views. Standard amenities include cable TV and a DVD player, a safe and a minibar. The room is fitted with an LCD cable TV, air conditioning and a minibar. Early check in, late check-out available, in-room sparkling wine, chocolate, flowers, 30-minute massage/person. This apartment has a balcony, hot tub and sauna. House rules Hunguest Hotel Sun Resort takes special requests - add in the next step! Hunguest Hotel Sun Resort accepts these cards and reserves the right to temporarily hold an amount prior to arrival. Pretty run down and dated. Way too pricey for the room and breakfast. AC in the room was hot, tv didn't work and the breakfast was buffet style cold and bland. I wld not recommend this place. You can get much better for the price especially off season.. The view and sea walkway. Maid to clean our room knocking on our door from 9am. Need privacy cards. Breakfast was also poor lack of food because hotel was at capacity. Friendly, informative staff. Warm and welcoming. They asked us to pay all five days when we arrived and we said we come back later to pay. We thought that is not a problem because normally you pay at the end. After that we found a note in our room that we have to come to the reception to pay for everything. Different people from the hotel came in our room in the middle of the day what made it a feeling that you don’t have privacy. Nice place directly at the beach. Very good located. The breakfast is really good. Nice view from the balcony and the rooms were good. Humidity in the room. Old furniture.